Your dough will rise, but your stress levels won’t. I come from a long line of bread people. Growing up, whenever something was wrong, my mother’s immediate solution was to present the situation with food—usually bread of some kind. Using cooking to assuage everyday problems is a cultural habit endemic to Greeks, and bread is the cornerstone of that philosophy. Peasant bread, flatbread, koulouria bread rings, dessert bread… we have bread for every occasion. The idea of a meal without bread is nearly unspeakable. What is one to do with all the orphaned olive oil that gathers at the bottom of a salad bowl? Leave it there without using some crusty bread to sop it up? Perish the thought. As integral as bread is to Greek culture, the act of preparing it is even more so. My mom, a native Greek and professional chef, bakes bread like it’s her civic duty. There is always a bowl of dough rising in some corner of our kitchen, “just in case” we need it. If I had a bad day when I was younger, I would come home and be presented both with a piece of fresh bread and instructions to put on slippers in the same breath; the trusty Greek one-two punch of providing food-based sympathy and reminding you that pneumonia is constantly imminent. Even now, when I return to New York after visiting home, I discover slices of stowaway bread in my bags that my mother snuck in. She taught us the emotional side to baking bread a long time ago—it’s a love language, a way to connect people, and a small culinary bridge to a culture and a family that lives halfway across the world. However, it wasn’t until recently that I discovered the actual therapeutic benefits of baking bread myself. There’s something immensely satisfying about a recipe that’s so simple yet yields such an impressive result. And as someone who generally operates under an umbrella of anxiety and stress, learning how to bake bread has been unexpectedly fulfilling—not in a knead-your-frustrations-away sort of way, but instead, due to its calming effect: You can’t rush bread. The whole process of waiting for it to rise (twice) before popping it in the oven encourages patience and slowing down. Set against the backdrop of a culture that prizes being constantly busy and always working, it feels downright indulgent. It turns out that I’m not the only one who thinks this way. Recent Pinterest polls show that searches for bread baking as a means of self-care are up 413 percent year over year; potentially tapping into a broader societal craving we have for simple, nostalgic practices—something we’ve seen with decor too. There’s a whole body of research dedicated to proving the benefits baking has on one’s mental well-being. One group of psychologists spoke to HuffPost about the positive correlation between baking and mindfulness. A 2016 study published in the Journal of Positive Psychology found that people who frequently partook in small creative projects—like cooking and baking—felt overall happier and more relaxed. It’s why we love TV shows like The Great British Bake Off and why bread-wielding professionals like Ina Garten have been elevated to the status of deity: Baking is a wholesome, almost nostalgic activity that serves as an instant mood booster from start to finish. My relationship to the buzzy wellness industry is capricious at best, so it’s safe to surmise that “bread therapy” isn’t going to be making it into any roundups of cutting-edge self-care methods anytime soon. But the whole point of this particular therapeutic practice is just that: It’s not new, it’s not fancy, and it’s not pretentious. It’s bread. And since everyone has a favorite way to make bread, the process is also a personal one, steeped in memory. For me, it reminds me of my mom and of Greece. Baking bread has become a sort of emotional salve, and a tasty one at that. Below are some foolproof recipes to kick-start your own foray into the calming world of bread therapy. Ready your olive oil. This recipe (which happens to be my mother’s) is a personal favorite—though be warned: It really does make a lot. If you’re feeling particularly generous, whip up the full batch of loaves and gift to your friends. Or you could just keep all four to yourself. It’s the Greek way. As far as easy instructions go, this bread takes the proverbial cake. It’s super simple and requires next to no attention. Make it the night before to enjoy it first thing Sunday morning with a knob of butter and your favorite jam. Why have one loaf of bread when you can have an entire fleet of mini loaves? These fluffy brioche rolls will last you through the week—just pop them in the fridge after a couple of days to keep them fresh. Use to amp up your eggs or to make a decadent sandwich. Mixed granola provides a welcome bit of texture and a burst of flavor. Rustic and crusty, this muesli bread is the perfect morning toast to go along with your coffee. For some reason, the prospect of creating your own baguettes is a daunting one, but it needn’t be. This beloved recipe comes together in just four hours and requires only four real ingredients. The result is a simple yet perfect baguette to be used as an aperitivo vessel for spreads and cheeses. 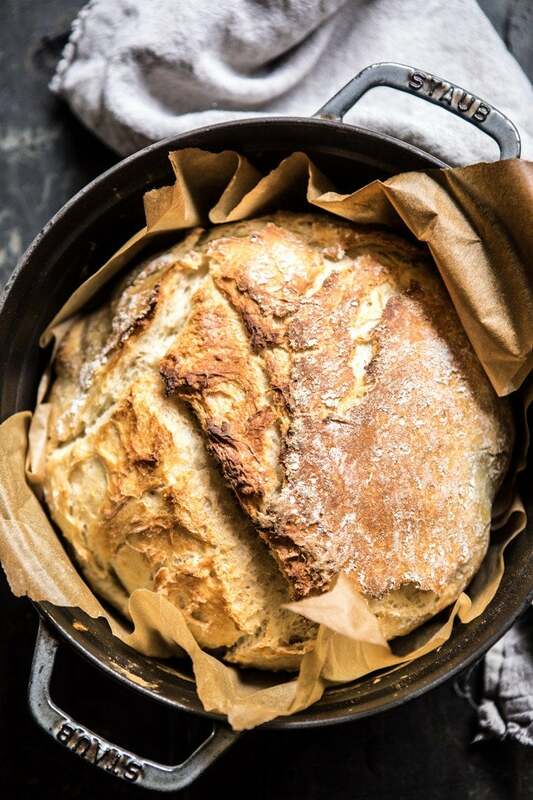 Put your dutch oven to good use with this easy sourdough recipe. The honey and yogurt make for a dense yet soft interior, while the crusty outside is baked to perfection.